“When a crime is committed under hypnosis, who is the real perpetrator?" “From time to time, something in the news calls our attention to something that our laws and our criminal justice system have not yet taken adequately into account. Masters takes us to a question that addresses some delicate areas of life. Before we look at the imagination and the power of identification that is its throttle, we can ask one of the most important questions in medicine. Are doctors deliberately conditioned and hypnotized in medical school and held captive by their local medical boards? “I discovered that physicians, despite their great power, were themselves subjected to very strict controls over every aspect of their professional lives. These controls, surprisingly enough, were not wielded by any state or federal agency, although almost every other aspect of American life is now under the absolute control of the bureaucracy. The physicians have their own autocracy, a private trade association, the American Medical Association. A broad-based attack on the fundamental paradigm/philosophy and commitment to “do no harm” to patients has been in operation for over a century. Pharmaceutical interests have betrayed the field of medicine and everyone in it by directing doctors and nurses to do harm, thus betraying their medical oaths. They have done this through a deep penetration of medical students’ imaginations just as a hypnotist does to his subjects. Are pediatricians responsible for their brutal treatment of kids or are they under the hypnotic manipulation of their pharmaceutical masters? Who are the actual perpetrators of pharmaceutical terrorism, the ones with the poisons in their hands (vaccines are loaded with toxic substances) or those who create and market the dangerous drugs and pocket the change, taking it home to their mansions at night? Dr. David Brownstein reminds us not to pay any attention to the propaganda about this year's flu shots because of all the poisons in it. “The flu shot contains a mixture of egg proteins including bird contaminant viruses. The multi-dose flu vaccines still contain mercury which is the third most toxic item known to mankind. You should not ingest or inject any mercury containing products. A clear question is about the men who have gone absolutely wild shooting up people and children while on, or on withdrawal from, pharmaceutical medications that are known to distort peoples sense of themselves and of reality. What or who is responsible? 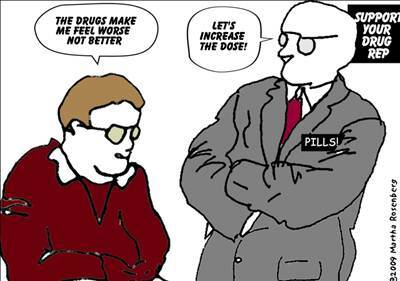 The antidepressants or those who prescribe them, dispense them, fabricate them, and regulate them? A Canadian judge ruled that Prozac was the cause that led a teenage high school student - with no prior history of violence - to inexplicably murder his friend by stabbing him with a single wound to the chest. The judge based his determination largely on the compelling expert testimony by U.S. psychiatrist, Peter Breggin, MD who submitted scientific evidence showing the risk of drug-induced violence posed by antidepressants such as Prozac. The judge was also persuaded by the fact that when Prozac was withdrawn from the boy, his behavior returned to normal. Dr. Breggin testified that his primary care physician and his parents alerted the prescribing psychiatric clinic to the boy’s deteriorating condition, but the clinic continued the Prozac and then doubled it. Certainly the act of madmen! This is the first criminal case in North America where a judge has specifically found that an antidepressant was the cause of a murder. The discovery that many people with life problems or occasional bad moods would willingly dose themselves with antidepressants sailed the drug industry through the 2000s. A good chunk of the $4.5 billion a year direct-to-consumer advertising has been devoted to convincing people they don’t have problems with their job, the economy and their family, they have depression. It is highly possible for a skilled manipulator to program someone else to do his or her dirty work, and even to convince the ultimate perpetrator that it was his own idea, that he acted on his own accord. A suitable subject can be programmed so as to have no memory of being programmed, or of the person who hypnotized him, or of the details of what happened. The lie about hypnosis is that one cannot be hypnotized to think what is untrue or to act against one’s own free will. This is false, and skilled manipulators have known this forever. The manipulators have guarded this secret carefully, partly by repeating the lie that such influence is impossible. fields of intelligence, resulting in fields of form. All forms are created of images. These images are in essence the super structure of the universe. They are the subsoil of everything. Everything has to take some kind of shape, some kind of form to come into a state of existence. Imagination is the creative power. Everything in the universe somehow has an image of itself. deepest psychological work we can do. If we cannot imagine something it means that we cannot really see that something. The imaginative level of consciousness is our ability to both shape and perceive reality. It is at the core of everything we think, feel, and do. In the deepest sense, our life is like a movie and our life situation is the substance of the movie. We are the ones who are making our own movie on the imaginative level of consciousness and we are the actors that act it all out. We spend our consciousness just like we spend money and we spend it through the imagination. We can create a great movie or a lousy one. It all depends on how we use our imagination, or let our imaginations use us. We are the ones making the movie of our own life and we are the ones who are either going to laugh at it all or cry our hearts out. that brings order out of chaos. It is this sight that makes men and women with open imaginations great. From nothing comes something. From the blank canvas comes a masterpiece. The imagination is the power with which we “will” events into a pattern and into existence. We form ourselves into a pattern of life and this is controlled by our creative imagination. The imagination is the power to be able to perceive the images of life. These images are happening on many levels and thus our imaginations itself has different levels of function. It is the basic capacity to see with our eyes and to dream with our mind that is the primary function of the imagination in human consciousness. The basic capacity of sight has two components and each is an aspect of the imagination. The image is in our own brain and it really has no size to it at all. We never “see” physical reality; we see our imagination’s representation of it. Everything in the “created” universe as an image, a shape, a form, and astral forms are those forms that continue even without any physical component. We are given the imagination to be able to see these forms. The process of identification is the key to the mysteries of the imagination. Imagination is the creative power - and the process of identification is that which traps or forms our consciousness into a mold. Identification is the deep psychic process of becoming one with something. It is through identification that we create our identity. When we identify with a feeling or a thought, we feed those impressions, we make them more important; we own them as our own and incorporate them into our self-image. It is through the process of identification that we become one with our experiences. They become ours. The negative expression of aggression here is the calculated use of the imagination to enslave men. Psychological warfare is an example, but beyond that, it is the armed use of the imagination by men who know that what people think about themselves is what they become. Thus, there can be no greater aggression than to consciously manipulate and promote unsuspecting men and women into seeing themselves as something they are not in order that they may be exploited.